If you work on technology, you need to understand innovation. If you work on technology and development, you need to understand inclusive innovation. In simple terms, inclusive innovation is the means by which new goods and services are developed for and/or by those who have been excluded from the development mainstream; particularly the billions living on lowest incomes. So new technologies for the base of the pyramid – mobile phones, mobile services, telecentres, better seed varieties, vaccines, etc – can all be included. We can chart the rapid rise of interest in inclusive innovation in various spheres. In the past few years, the World Bank, IDRC, GIZ, OECD and other development agencies have all launched inclusive innovation actions. India, Thailand, China, South Africa, Indonesia and other national governments have added inclusive innovation elements into their policies. 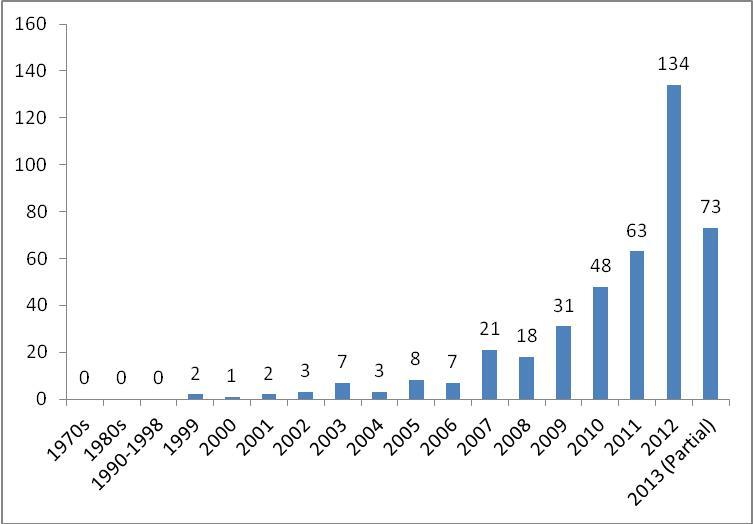 And – as shown in Figure 1 below – academic publications related to the topic have been growing fast. But what exactly is “inclusive innovation”? The growth in publications means an increasing diversity of views, which now demand some overall conceptualisation. This has two key aspects: firstly who, secondly what. And if (some of) this group are now being included in some way, in what are they being included? Level 1/Intention: an innovation is inclusive if the intention of that innovation is to address the needs or wants or problems of the excluded group. This does not relate to any concrete activity but merely the abstract motivation behind the innovation. Level 2/Consumption: an innovation is inclusive if it is adopted and used by the excluded group. This requires that innovation be developed into concrete goods or services; that these can be accessed and afforded by the excluded group; and that the group has the motivation and capabilities to absorb the innovation. All of those stages could be seen as sub-elements of this level of the inclusive innovation ladder, though all will be required for consumption so they are not hierarchical sub-steps (as appear in later levels). Level 3/Impact: an innovation is inclusive if it has a positive impact on the livelihoods of the excluded group. That positive impact may be understood in different ways. More quantitative, economic perspectives would define this in terms of greater productivity and/or greater welfare/utility (e.g. greater ability to consume). Other perspectives would define the impact of innovation in terms of well-being, livelihood assets, capabilities (in a Senian sense), or many other foundational understandings of what development is. For those with concerns about inequality, this could include a condition that the benefits were restricted to the excluded group, or were greater than those achieved by ‘included’ groups using the innovation. One can therefore differentiate an absolute vs. relative notion of inclusive impact of innovation, the latter being a sub-step above the former. Level 4/Process: an innovation is inclusive if the excluded group is involved in the development of the innovation. It is highly unlikely that the entire group could be involved so – as noted above – this immediately shrinks down to “members of the excluded group”. This level needs to be broken down according to the sub-processes of innovation: invention, design, development, production, distribution. These would create a set of sub-steps with, for example, an assumption of greater value of inclusion in the upstream elements than the downstream elements. Further complicating matters, the extent of involvement is equated with different levels of inclusion. Again, there would be sub-steps akin to those seen when discussing participation in development, with higher sub-steps representing deeper involvement. 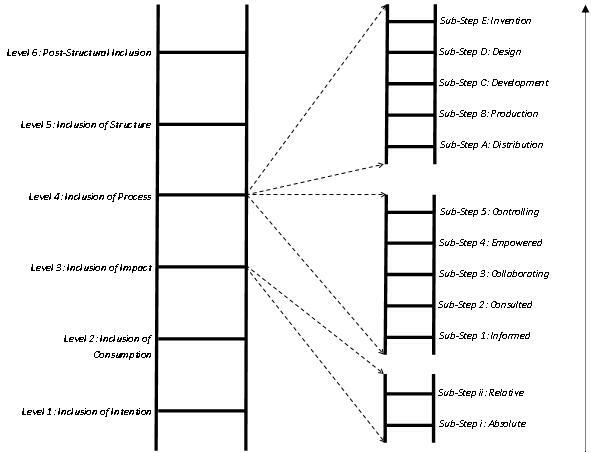 Borrowing from Arnstein’s ladder of participation, sub-steps can include: being informed, being consulted, collaborating, being empowered, controlling. Level 5/Structure: an innovation is inclusive if it is created within a structure that is itself inclusive. The argument here is that inclusive processes may be temporary or shallow in what they achieve. Deep inclusion requires that the underlying institutions, organisations and relations that make up an innovation system are inclusive. This might require either significant structural reform of existing innovation systems, or the creation of alternative innovation systems. Level 6/Post-Structure: an innovation is inclusive if it is created within a frame of knowledge and discourse that is itself inclusive. (Some) post-structuralists would argue that our underlying frames of knowledge – even our very language – are the foundations of power which determine societal outcomes. Only if the framings of key actors involved in the innovation allow for inclusion of the excluded; only then can an innovation be truly inclusive. The levels are akin to steps on a ladder because each level involves a gradual deepening and/or broadening of the extent of inclusion of the excluded group in relation to innovation. In general each level accepts the inclusion of the levels below, but pushes the extent of inclusion further. Thus, for example, those concerned with inclusion of impact accept – necessarily – the value and actuality of inclusivity of intention and consumption, but feel this is not sufficient to fully justify the label of ‘inclusive innovation’. The corollary is that a commentator standing at any particular step of the ladder would not regard views or practice at lower levels to represent true inclusive innovation. Taking the example of those at the base-of-the-pyramid as the excluded group, commentators at Level 4 would feel innovation is only inclusive if those on low incomes somehow participate in the innovation process; perhaps typically in the development of the new good or service. A new good or service which benefited the poor without this (i.e. an innovation at Level 3 developed non-participatively by a large firm or by government) would not be regarded as an inclusive innovation. One may also detect a move from the positive towards the normative in ascending the ladder, with a decreasing number of real-world examples as one ascends. Thus there are many examples of new goods and services which are developed and consumed by excluded groups, some of which have a beneficial impact. Involvement of excluded groups in innovation processes is not frequent but it does occur. However, one may be harder-pressed to find examples of structures let alone widely-shared knowledge frames in practice: these levels may represent aspirations more than realities at present. Armed with the ladder model, we will find that dialogue, research, policy-making, practice, etc. are easier to achieve because all parties have the basis for framing their own understanding of inclusive innovation, and that of others. However, this is just a first attempt. So comments or pointers to other conceptualisations of inclusive innovation are welcome.